Where potential comes to play. Every child deserves to be known and loved, and our small class sizes and low student/teacher ratios empower us to live this value every day. 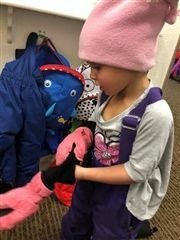 BCD Preschool is a unique learning environment where teachers can build meaningful relationships with each student, nurture their strengths, and help them meet goals through focused, individualized attention. Preschool is all about learning how to be kind and thoughtful, be a good friend, and give back. That’s why our motto—Respect yourself. Respect others. Take responsibility for your actions.—is emphasized throughout the school, and character development is an important part of each day. Conflict resolution skills are taught on a daily basis as teachers model appropriate communication, behaviors, words, and strategies for expressing emotion. Our classrooms and routines are structured and follow a general “flow” each day. However, our routines are flexible and maintain a balance in all that we do. We challenge our students to reach their highest potential by using research-based curriculum and differentiated teaching practices. Our faculty is the heart and soul of BCD, and every member of our preschool teaching staff is committed and passionate about early childhood. Preschool lead teachers have either a bachelor’s or master’s degree in early childhood or elementary education (or a degree in a different field and coursework in early childhood education). Preschool assistant teachers are all qualified early childhood teachers in the State of Colorado. BCD encourages professional growth by providing our faculty opportunities to engage in ongoing professional development and continuing education. BCD promotes strong and lasting family/school connections. Parents are always welcome and encouraged to actively participate in classroom activities, field trips and school events. Our beautiful BCD campus is a safe and secure place for young minds to begin their educational journeys. What’s more, being part of a bigger school means our outstanding facilities are unmatched by any other preschool in the area. 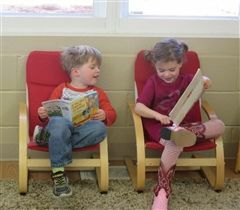 BCD’s preschool program welcomes students starting at age 2 1/2 and runs through Pre-Kindergarten. Our curriculum uses language arts and literacy as its framework. Our method of teaching incorporates best practices in education while supporting major objectives in language arts and literacy, number concepts, science, social studies, self-help skills, fine and gross motor skills, and character development. Promoting language arts and literacy skills is an important part of BCD’s preschool program. We believe in the importance of exposing children to upper and lowercase letters, letter-sound relationships, and phonemic awareness. Beginning reading and writing skills are fostered as teachers actively engage in building children’s conceptual understanding of the printed word in relation to spoken language. In addition, BCD’s preschool program promotes children’s beginning understanding of mathematics, numeric and science concepts. 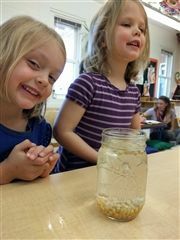 Children engage in math and science daily - using age appropriate and hands-on, experiential learning activities that connect to and support their everyday world and experiences. Furthermore, preschool children attend a special science class in our science lab every other week. Social studies is highlighted as children discover the world in which we live in connection with their families, neighborhoods and communities. Respect for people and the world are daily focal points and problem solving, character education, and conflict resolution skills are intentionally fostered. 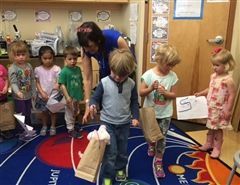 In addition to our strong academics, Boulder Country Day’s preschool program incorporates a “Specials” curriculum that includes instruction in world language (French and Spanish), movement, music, and library skills, science, and technology. Our specials curriculum helps to ensure that every preschool child begins to discover his/her excellence. We believe that it is a privilege to educate your child and that your child will have the opportunity to discover his or her own excellence at Boulder Country Day. Overwhelmed by choosing a Preschool for your child? Unsure if you want an academic or a play-based environment? Download the attached free Guide to Preschool Choice for guidance. BCD has taught me how to be a good friend. Last week I had the pleasure of seeing many parents coming and going from their parent and teacher conferences and heard many comment on the depth in which our teachers knew their child: their strengths, challenges, and opportunities for growth. Button, Zip and Tie: It’s Time to Go Outside! Each week I have the privilege of cooking with the children. This is always a highlight of my day and I’ve built it into my schedule. I see the preschool classes on most Mondays and the prekindergarten classes on a rotating Friday schedule. Cooking in the classroom truly is a recipe for intentional teaching and playful learning. 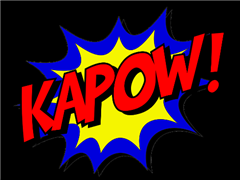 Over the past few weeks the class as a whole has started to feel more confident about their letter – sound knowledge and how to use this knowledge in their reading and writing efforts. Letters are among the most significant memorial a person can leave behind. As I walked around the building this morning I was reminded of the volume of mathematical learning that goes into the days following Halloween. Recently we participated in a process that is commonly known as the Plan-Do-Review cycle. The High/Scope educational approach revolves around children choosing their activities and making their plan, participating in that activity before moving on to another one - the doing component - and then reviewing and evaluating their work or experience. The point of the review is to assess whether or not the child successfully followed through with their plan. Sometimes there is an end product, but a plan can be as simple as going to the block area to make a specific structure. At BCD we strive to create an environment that is welcoming to all our families. In any grade, we love to invite people into our rooms to share their passions, their skills, their knowledge, and their culture. These visits are so much fun and ultimately help us create a better understanding of who we are as a community, recognizing and celebrating the cultural and linguistic diversity of our school. During the school day, we often discuss how independent the children can be, whether changing their own water while they paint, clearing the table after lunch, setting up their own art projects, or simply putting on their snow gear. Every few weeks we change the theme of the dramatic play area…we may or may not also change the layout of the classroom because of it. When I was in preschool (yes, I still remember it) the dramatic play space was an area that resembled a play kitchen, had some dress up clothes, and a few fancy hats. I remember having fun in that area, but it never changed. When my younger sister entered that classroom, it was still the same kitchen, with the same dress up clothes, and a bunch of hats that used to be fancy. Our classroom will most likely have 8 to 10 different themes this year, please feel free to help with an area if you are so inclined. We have already had a baby care center and a sandwich shop. Ideas that we have used in the past include an art studio, grocery store, bakery, juice, bar, farmers market, spaceship, campsite, entomology lab, submarine, and a flower shop. Regardless of the props, the underlying beauty of a dramatic play area is still the same: It is a safe place for children to experiment with the social and emotional roles of everyday life; And,it is a place where children can be creative and use their imaginations, not confined by the structure of a teacher initiated idea or activity. The children are learning to interact with their peers and the world around them, pulling knowledge from things they have personally experienced, things they have seen in books or on TV, and conversations they have had or merely just overheard. There is often “drama,” heated phone calls, and sometimes a life or death situation…but in the end, there is always a happy ending! 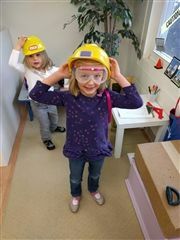 This week we began a theme on construction, always a favorite with the children. This week we brought Science Lab into the classroom! Reading with a pre-K class teaches us many things. For starters, it is a lesson in patience, for everyone. At this age, we are still learning the rules of listening and speaking, and listening to a story in a large group can look very different to listening to a story in the lap of your parents. We have to learn to “hold our thoughts in our head” until we reach the appropriate time to talk, and then we have to learn when that appropriate time to talk is. We are also learning the difference between a comment and a question, not an easy feat at this age. I could tell you what we learn about the rules of print – how the letters and words flow from left to right, and how the pages all turn in the same direction. I could explain how we begin to comprehend the concepts of beginning, middle, end and understand the meaning of words like plot, characters, and setting. I could tell you that we are working on logical thinking, problem solving, picking up on visual cues, reading character’s expressions, understanding the nuances of conversation, and even listening for tone…but really, I just want to convey that we love books, and we love to read, and we get a great deal of our community spirit from this activity each day. So, if you have a moment and would like to share a favorite story from your own childhood, come on in…any day…any time…and we will stop what we are doing and join together for a magical moment with you and your book! Multisensory learning is learning that involves two or more of the senses within the same activity: auditory (through their ears), visual (through their eyes), tactile (through touch), kinesthetic (through body movements). Sensory experiences are sticky, slippery, gooey, heavy, bumpy etc. Children learn best by having hands on experiences with materials so sensory materials are vital to your children's learning. 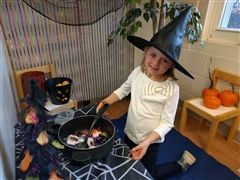 Through sensory tubs like those in our 'Witch's Kitchen' the children are manipulating materials and learning to understand concepts such as more/less, full/empty, cause and effect, liquids and solids. Sensory experiences are also exciting which leads to children utilizing their language skills to express themselves and because they are often open ended activities children are able to use their own creative thinking skills to decide how they wish to use the materials. Such activities set the children on a path of discovery, working with each others to investigate and observe. Sorting is a beginning math skill. It helps children to organize their world and differentiate properties of objects. 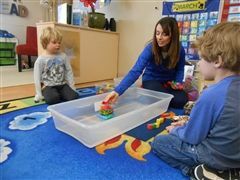 It is also a building block to numerical concepts, which later require children to group “sets” of objects in math computation such as multiplication and division. The more complicated the sorting is, the more high-level understanding is involved. As adults, it is important to keep in perspective that what we may see as a simple activity of sorting a pile of shapes into red circles and red squares is really the beginning of a child’s mathematical discovery. 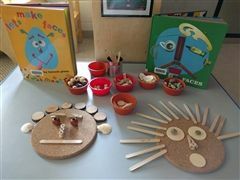 Through guided discovery, we introduced the children to ‘Loose Parts’ this week and as a stimulus used the book ‘Let’s Make Faces’. What are loose parts and why do we use loose parts with young children? Loose parts are materials that can be moved, combined, lined up, redesigned, taken apart and put back together again in multiple ways. They are materials with no specific set directions enabling the children to use their imagination and creativity through open ended learning. I have included some photos of the ‘Loose Parts’ faces that the children made this week. This month we have spent much of our free time sewing, gardening, bird-watching, bunny-watching, and walking/sightseeing/observing nature at Twin Lakes. We use these activities to teach everything from outdoor etiquette and safety rules…like passing on the right side of the path, and how to safely cross a road, to patience while we wait for our sewing needles to be re-threaded, or learning to wait for the kale to grow enough so that we can pull off a piece and eat it. We have had so much fun! This week we have continued with our ocean theme, focusing on beach life and creatures that live along the rocky shores. The children have been fascinated to learn about the different animals and all the fun that can be had at the beach, sharing their own experiences of vacations. We're a long way from the ocean here in Colorado so it has been fun to bring this part of the world into our classroom and an interesting educational experience for the children. The children have enjoyed the 'oose parts creativity making sea sculptures with play dough, ocean pictures, and sand castles in the tuff tray. 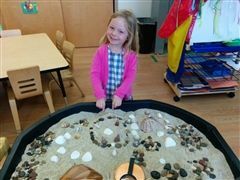 They have been sorting shells and pebbles and making mathematical patterns with shells in the sand. Engaging children with an interesting topic makes learning fun, keeps their attention and allows for many cross curricular learning opportunities. On Wednesday morning, one of the children asked if I would get out our apple peeling machine so that we could all peel, core, slice, and eat our own apples. First of all, I love that the children assume that I always just carry things such as an apple peeler and 14 apples with me - like perhaps I could just pull 14 apples out of my purse! Secondly, my response, as in all matters where I can’t think of a good reason to say no, was “Absolutely! However, in order to help me to remember, would you please write me a note that I can take home to help remind me to put it in my car?" And so our first persuasive essays were born. The children were required to draw a picture and write a sentence about something that they would like to revisit in our classroom. 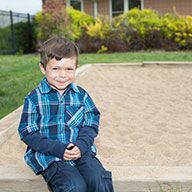 The list includes themes that they would like to see again in the dramatic play area, specific activities that they would like to do again, books they would like to read, and places they would like to go. Using the book 'Who Sank the Boat?' by Pamela Allen as a storytelling stimulus we investigated our own question 'What Sank the Boat?' 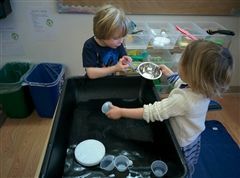 The children made predictions of which materials would sink the boat and how much of each material the boat would hold. This was accompanied by whoops of excitement and surprise. The children continued this work in our water table during independent exploration time. Through these activities the children we learning to predict, cause and effect, counting and charting! In science class this week, the students engaged in a project that emphasized engineering skills. In this project, they had to design a carrier/tote that had a handle and was strong enough to carry stuffed animals from one side of the classroom to the other. They had to think about the materials they could use to make their design strong. It was wonderful seeing them learn what worked well and what they needed to change to carry their design successfully. 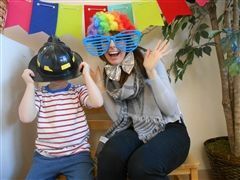 The children have been enjoying our latest dramatic play area this week - a photo booth! They were particularly excited to see a real camera available for them to use and from all the giggles that have been coming from the photo booth, they are truly enjoying the stimulus. The children have worked together to dress up using the props and then taking photos of each other. The results have been impressive and given us many laughs. Here are some of this week's photos to enjoy! I love to provide opportunities in the classroom that enable the children to use real tools. A camera is a perfect example for young children because whilst it provides a true experience for the children there are no safety risks. We were able to have a good discussion on how to use the camera carefully so as not to break it, understanding the true consequences of misusing it. The use of a real camera makes the play area far more interesting to the children and provides a real sense of accomplishment and joy on seeing the results. Young children are very capable and offering them the chance to use real tools acknowledges their abilities. The children are truly bonding with each other through this experience, they are learning to play cooperatively, taking turns and helping each other. We plan on using some of these fun photos as writing stimulus. The theory of loose parts has begun to influence educators in a big way. This wonderful term was first used by architect Simon Nicholson who believed we are all creative and that 'loose parts' in a learning environment will empower creativity. In a preschool, loose parts are materials that can be moved, carried, combined, redesigned, lined up, sorted, taken apart, and put back together in multiple ways. They are materials that are used in with no specific set of directions that can be utilized alone or combined with other materials. Natural 'loose part' examples include water, sand, dirt, sticks, grass, leaves, pine cones, pine needles, seeds, shells, feathers, etc. On a playground loose parts may include hoops, balls, rocks, straw, dirt, buckets, water, containers, tools, chalk, and fabric. In an indoor environment these may include blocks, pouring devices, buckets, play animals, pebbles, recycled containers, boxes, caps, foam, tubes, and cardboard, to name a few. Research shows children choose loose parts over fancy toys. Often, children would rather play with cheaply available materials that they can use and adapt as they please, rather than expensive pieces of play equipment. When we step back and give them the time and freedom to move things around, these pictures show you what happens. Sometimes only the children know what they are creating and they don't always use the materials in they way an adult would expect. This structure in the photos began as an ice cream store, morphed into a banana launching machine and finally became an animal washing machine. As the children were building I heard them talking about "angle makers, slopes, slides, ramps, and barriers." Here is the beginnings of engineering in action! In these photos the children have moved a variety of 'loose part' materials from different outside spaces to build themselves a campfire. The children worked cooperatively to move the heavier logs together. In their bowls they are mixing a dinner of rocks, sand and twigs. Delicious! And just in case you were concerned about them stepping in the fire, they have it covered with their lava protection shoes! Giving meaning to loose parts requires us to think about how a child learns and to consider the materials and environments he/she uses. Open-ended loose part materials, environments, and experiences create endless possibilities, encourage problem solving and invite creativity. This week we have been seeing spots and stripes in all sorts of patterns around our classroom. For one project we were adventurous and introduced the children to some simple ‘Circle Painting’ using a famous Kandinsky painting as our inspiration. Circle painting is a collborative painting where a group of people work on a piece of artwork together. Through collaboration the artwork develops as each person adds their own idea, line, shape or color. The children let go of it being their painting and work inclusively alongside each other at the same time, getting inspiration from others as they work and learning to be part of a team. This proved to be a very calming activity for the children as they moved around the painting filling in spaces, adding to other friends marks. The children focused on making circles as this is a shape they are able to make. 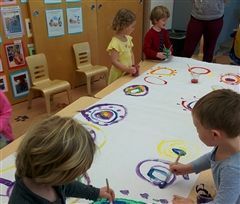 They painted one circle then moved onto another circle that a friend made, adding to their circle. This continued until the painting was finished. I was impressed with how everyone accepted each other’s contributions and shared the paints. 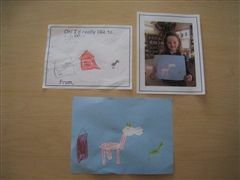 It was also great to hear the children comment so positively on their piece of art as it began to take shape. Their finished artwork is now hanging like a colorful tent from our classroom lights. This week in our Morning Meeting we have been sharing a book called Peaceful Piggy Meditation by Kerry Lee Maclean. This is a wonderful book for teaching children how to cope with the often busy world they live in and the many emotions they navigate during the day. We have been teaching the children how to take a break, using slow breathing to help calm their feelings, and enable their brains to make safe and thoughtful choices. We modelled to the children how busy their minds might feel sometimes by filling a jar of water with sand and shaking it. The children watched the sand settle to bottom of the jar until the water was clear again. We used this to demonstrate visually how breathing can quiet our mind and help us focus on our learning. This week we have been busy rearranging the classroom to provide more areas of continuous provision. These areas allow children the opportunity to continue and extend their learning without adult direction. Between 7:50am and 9:00am each morning the children have a period of time we call 'Exploration.' During this time the children explore the unique areas of continuous provision in the classroom. All areas are carefully planned and materials thoughtfully chosen to engage, provoke thinking and challenge your child in his/her learning. While this may look like "play time," our morning Exploration is a valuable learning opportunity. I encourage you to ensure your child arrives at school early enough to have time to participate. In addition to these scientific skills children are also developing their hand-eye coordination, strengthening gross motor skills, learning new vocabulary, engaging in talk about their discoveries and stretching their imaginations. Whilst children may gravitate towards using simple, repetitive activities during water play, their experiences can be broadened with the use of ladles, straws, basters, and plastic droppers. These tools are challenging to manipulate correctly so that they draw in and expel water. Sifters and colanders add another layer of challenge and exploration. With experience, simple water play will give way to more precise and complex activities. We have made our shelving more accessible for the children enabling them to obtain tools and materials easily whenever they need them. We have provided an array of tools allowing for an engaging learning experience, offering a range of challenge to the children. Our Annual Preschool Olympics will be held on Friday, January 29th at 8:30am during assembly. Seven years in, this event is hands-down a favorite assembly for many. Students and faculty from across campus look forward to cheering on our youngest students as they demonstrate their camaraderie, determination, stamina, and courage. Many BCD students fondly remember being in preschool and experiencing firsthand the thrill of our Olympic Games and the “I did it!” sense of accomplishment following the event. BCD’s annual Preschool Olympics represent happiness and joy in their truest forms. 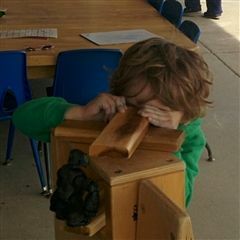 The Preschool Olympics do more than entertain. They provide an opportunity for preschool students to gain a deeper understanding of the world in which we live. Still so close to their birth at three, four, and five years of age, young children experience the world anew each day. Be it at home, in the car, at school, at the supermarket, or on the playground, their understanding of life and the boundaries it presents redefine what it means to be a part of a community and the greater world around us. The Preschool Olympics remind us all that we are a part of something bigger. The Olympics also offer opportunities for our preschool students to delve into international studies and learn about each other’s families, heritages, cultures, and traditions. 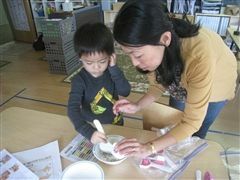 In the time leading up to the Olympics, the preschool students engage in hands-on learning experiences that connect them to the greater world in which we/they live. These experiences include in-depth study of picture books (both fiction and non-fiction), cooking projects, art projects, and parent sharing of family history and stories. 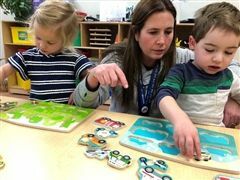 Perhaps even more significant is how the Preschool Olympics connect our youngest students on campus with the rest of Boulder Country Day’s students and faculty. Our preschoolers truly are BCD Bulldogs and represent the school and an existential place where they develop their individual identity in relational experiences with others. For our youngest students, school - in combination with home – truly is their world. We take pride in our youngest students. We believe in their potential and nurture them with care and compassion as valuable members of our school community. They are the creators of, and contributors to the world and the culture in which we live. They are our future and BCD’s Preschool Olympics helps them shine. 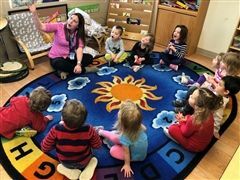 Preschool is a time of exploration, experimentation, and creativity and we strive to provide the children in our class with an abundance of these experiences during each day. We offer a wide range of tools and brushes for creating paintings, prints and collages for experimentation and freedom of expression. However, we also see the value in teaching the children to "color inside the lines." Around the age of 3-4 children become more interested in making representational drawings which usually begin with faces. They also become interested in writing letters in their names. At this time preschoolers begin to benefit from some coloring activities. They are already making big efforts to control the way they move their crayon or pencil over the page. Trying to stay within the lines of a coloring picture is an extension of the same learning impulse and helps children learn to transition from making large sweeping movements with their arms and to smaller and more intentional movements using just their wrists and fingers. Whilst coloring in this way may not be seen as creative, it is developing key hand-eye coordination and fine motor skills which are fundamental in supporting the development your child's handwriting skills. The activity of coloring has other benefits. The practice generates wellness, quietness and also stimulates brain areas related the senses and creativity. It can begin to develop mindfulness in children, as they focus on one repetitive action. For some children, coloring can initially be a challenging task as they build up stamina, whether this is physical stamina in their hand muscles or stamina in concentration and stillness. 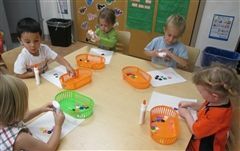 Each week in class as the children focus on the letter of the week, we always provide a coloring activity that connects to the letter. 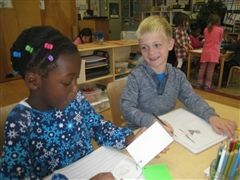 This week Preschool is using drawing and labeling experiences to create individual dictionaries. Each day students have added at least three words (of their own choosing) to their dictionaries. In turn, they use the dictionaries alongside their journals to help build confidence as well as develop appropriate writing habits and strategies. STEM stands for Science, Technology, Engineering and Mathematics and preschool is a perfect time to introduce children to these concepts when they are naturally so inquisitive and curious about their world. In our recent conferences we spoke to some of you about helping your children become more resilient. In preschool we measure that resiliency by many characteristics including the ability to be autonomous or independent, and only ask for help when it is really needed. The children have been busy counting and baking in our dramatic play kitchen too. This week the children are baking cookies and counting the sprinkles as they add them to the top. We are also highlighting shape recognition and talking about the different shapes of the cookie cutters. Some cookies have even been served with milk after reading If you give a mouse a cookie by Laura Numeroff. Our dramatic play area changes on a monthly basis. The theme is most often chosen by the children in a democratic fashion. We brainstorm lots of ideas, and then vote for our favorite. Once we have the theme, we brainstorm what kind of props we need to put in it. We started the year with a sandwich shop and as of this week, we created a veterinarian’s clinic. The children are invited to bring in small stuffed animals from home that are in need of medical attention over the coming weeks. While I may be ultimately responsible for furnishing and initially arranging the area, the children themselves are responsible for the learning that follows. 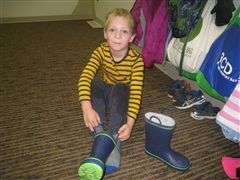 Through dramatic play, the children are engaging in creative and imaginative scenarios that stem from experiences that may have had themselves, read about in books, heard about through listening to adult conversations, or seen on the television. They are role playing, mimicking and imitating behavior. At first they may limit themselves to things that they have experienced directly, but soon their thoughts become more independent and abstract, as they incorporate words and actions that either come naturally, or they observe their peers doing. We are always sure to put just enough things in this area so that there are no conflicts, but also so that the children have to learn to wait in line and take turns. Dramatic play is a great place to see how the children are growing in terms of their social skills…no one plays alone in dramatic play. The children loved reading and acting out the classic book, Caps for Sale by Esphyr Slobodkina. The children love to act out the role of the peddler with his colored caps on his head, shaking his fists at the monkeys. It is amazing how these old classics are such favorites in our classroom! Other books they have enjoyed this week are, Chicka Chicka Boom Boom by Bill Martin and The Very Hungry Caterpillar by Eric Carle. 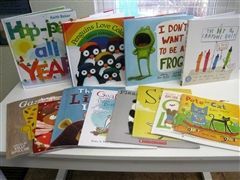 Repetition and rhyming words make these books so much fun to read again and again! 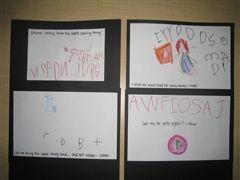 Retelling storys using pictures as prompts is one of the first stages in learning to read. 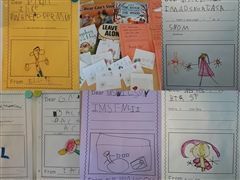 Predictable books such as the books we are currently reading in class are designed to to make their texts memorable. Their structure specifically encourages children to chime in as the adult reads and helps them to recall chunks of text during independent retellings.